Farrar, Straus and Giroux (BYR), 9780374301217, 40pp. It is too scary out there. Peep wants Egg to hatch so they can do fun things together, like watch the sunrise, splash in puddles, and play hide-and-seek. 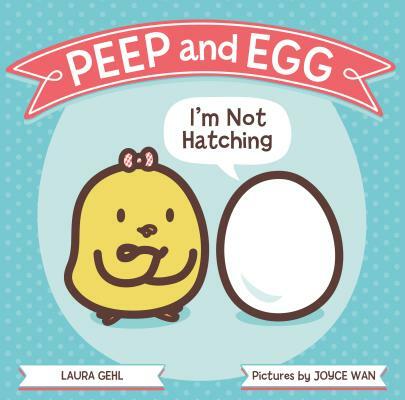 Joyce Wan's bright and bold illustrations will have young chickies giggling at Laura Gehl's reassuring tale that takes the not out of I'm not. Laura Gehl is the author of several picture books, including One Big Pair of Underwear, illustrated by Tom Lichtenheld. Laura has four children, three of whom waited to hatch until well past forty weeks. She and her family live in Chevy Chase, Maryland. Joyce Wan is the author and illustrator of many popular board books, including You Are My Cupcake and We Belong Together. She is also the illustrator of Sandra J. Howett's Sleepyheads. Joyce lives in New York City.